12 Trendy Spirit Wear Items to Kick Start the School Year! A new school year is the perfect time to get trendy spirit wear into the hands of your students. From freshmen to seniors, students will love all of these 12 trendy spirit items. Stock up on them now for your school store, Spirit Week fundraisers, and other fall events! 1. 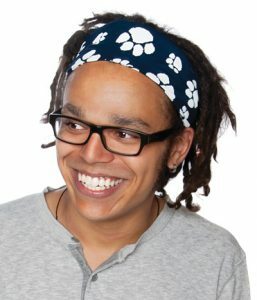 Bandanas are popular wearables with students. So, make sure you have plenty of custom (or stock) bandanas or pep rags on hand so they can show off their school colors and school pride during the new school year. 2. Jewelry is always a top seller with female students and fans. Kick off your new school year with a fresh new inventory of jewelry for your school store. 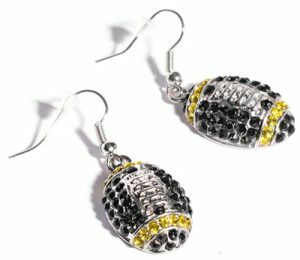 Fill your counters with football earrings and necklaces, bling bracelets, and more. 3. Spirit Wigs are available in a variety of crazy, trendy styles that fans of all ages. Make sure you have lots of wigs in your school colors for the new school year, Spirit Week, and the Homecoming game. 4. 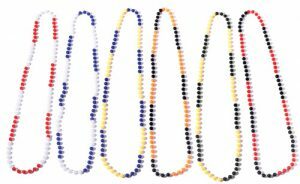 Beads are both a classic and trendy spirit product that can be used in many ways for school events. Keep a healthy stash of beads (round, football, basketball, etc.) in your school store all year long, in concession stands, or use them for a quick school fundraiser. 5. Hair Bows and Hair Ties are small spirit items that make a big fashion statement. These trendy spirit products are sure to be best sellers with your female students! Make sure to sell them in your school store on the first day of school. 6. Infinity Scarves can be a fun addition to any outfit. You can even use them as spirit items in your school store or concession stands. Trendy scarves in your school colors are sure to be best sellers. 7. Spirit Tutus are definite attention-grabbers, making them a trendy spirit item that students will love. Tutus in your school colors add a frilly flair to any game day spirit ensemble! Use them as a unique back-to-school fundraiser. 8. Spirit Bibs shout your school pride, from head to toe. Students will get a kick out of wearing spirit bibs to all sorts of school events, especially the Homecoming game! 9. Masks are typically associated with masquerade parties, but they’re also trendy ideas these days for spirit items and fan gear. Spirit masks in your school colors make a whimsical item for your concession stands or a Pink Out day. 10. Sunglasses are always popular with teenagers. Choose some new, trendy styles with your custom school logo to stock in your school store. And they can be taken anywhere so students can proudly show off their school pride! 11. EyeBlacks for game days are a must-have spirit item. And there are always trendy new designs to choose from that are specific to your school. Look for EyeBlacks in your school colors or mascot for concession stands. 12. Wristbands are a versatile, as well as trendy, spirit item. These wearable spirit products can be used for everything from game admittance to student awards to school pride items. Stock up on custom or stock wristbands for your school store or next school fundraiser. Which of these trendy ideas will your school choose for the new school year? Let us know! We’d love to hear from you.